The Vermont Human Rights Commission is pleased to invite you to our 30th Anniversary Celebration on Thursday, April 18th, from 4-6pm! 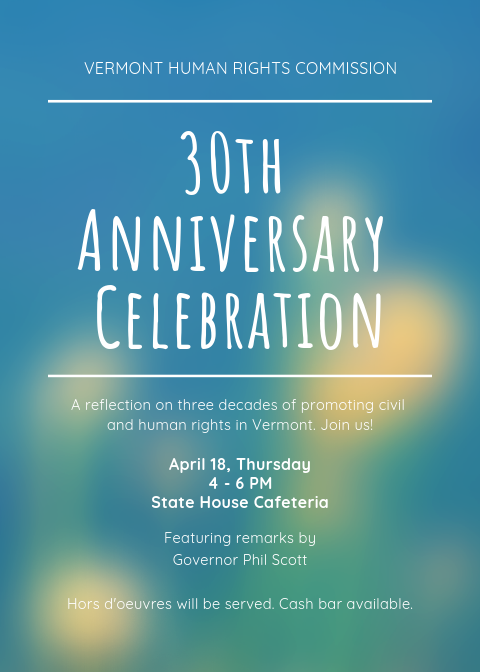 Join the Commissioners and Staff of the Human Rights Commission alongside Governor Scott as we reflect on the last 30 years and look to the future of civil rights in Vermont. We encourage you to share this invitation with colleagues, friends, or others who may be interested in attending the event. This gathering is open to members of the general public.